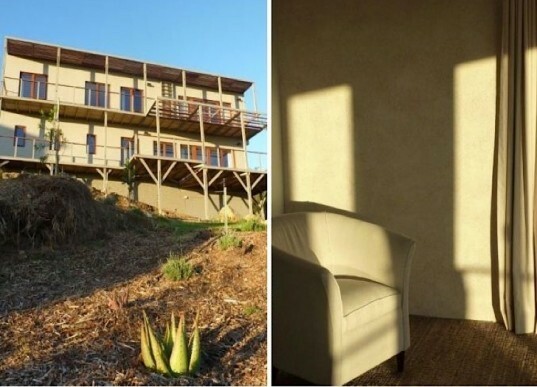 Hemp House: South Africa's Most Sustainable Home Made From An "Illegal Narcotic"
Because South African authorities do not distinguish between hemp and the euphoric THC-laden "dagga" plant, its benefits as a super-sustainable building material have largely gone untapped. 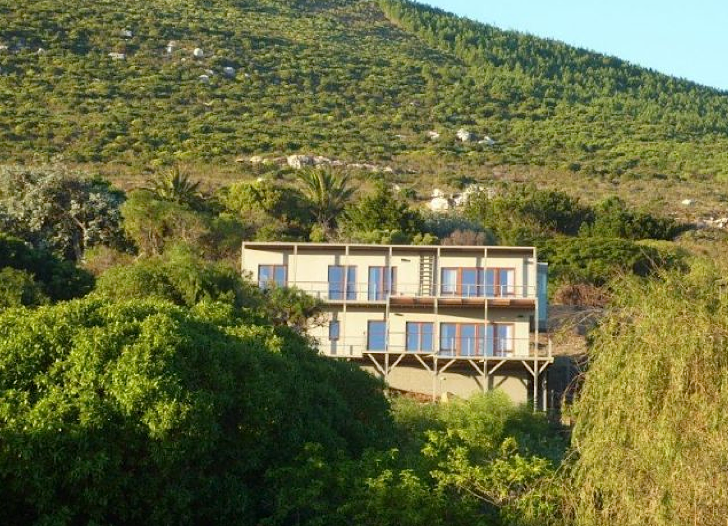 Until now - a tireless hemp advocate, Tony Budden joined forces with Dutch architect Erwin van der Weerd from Perfect Places to build South Africa's first seven-roomed hemp house in Noordhoek. The home is designed to showcase hemp's incredible potential as a building material and convince the government to remove obstacles for widespread commercial development of one of the most resilient, versatile, and fast-growing carbon sinks on earth. Tony Budden and his partner Duncan Parker aimed to give the Hemp House the lightest carbon footprint possible, but had to import most of the materials since South Africa lacks a domestic supply of hemp products. The internal modular walls are comprised of hemp insulation and sealed with magnesium oxide boards, while the external walls are made from a lime-based hempcrete that is considerably less energy intensive to produce and less dense than traditional cement. But what makes the building South Africa’s most sustainable? It is passively cooled, heated, and ventilated, incredibly well insulated, and partly powered by solar energy. The floors are made from sustainably-sourced cork, 85% of the furniture and cabinetry is made from hempboard, and all of the grey and black water will be treated and recycled. Also included are LED lamps to reduce energy use, eco-paints to prevent harmful off-gassing, and reclaimed stone. Not only is the Hemp House an impressive achievement in sustainable building, but Budden’s determination to overcome misguided regulatory roadblocks to illustrate the huge environmental and social advantages of growing hemp locally puts this groundbreaking home on par with Nelson Mandela and Desmond Tutu peace efforts. Already government officials are reconsidering their formerly-held bias against what is actually an excellent antidote to water and chemical-happy fibers such as cotton. Hi Tony, I fully support your cause. This is the direction the world needs to take in order to not only utilise the thousands of benefits hemp provides but also the environmental benefits linked directly to the very existence of human kind. Thank you for your commitment. How can I get involved? http://www.limetechnology.co.uk/pdfs/projects/Adnams_Brewery.pdf check this link to see the amazing industrial/commercial capabilities of hemcrete. It doesn't really come out in the SA house article but because of hemcrete's ability to maintain a constant temperature no heating system is required. AMAZING!! DaggaParty, thanks for your comments, but there are a few points you would like to raise. Firstly, with a carbon saving of around 500kg's per m2 of wall when compared to brick and cement, event putting the transposrt of one 20ft container from France to SA, the hemp will still be lessening emissions. Please can you let me know where you get thet amount of 40t/ha of biomass for dagga from? Hemp is harvested after 100 days for fibre, while outdoor dagga is usually in the ground for 6 or 7 months. Hemp left to go for that long would also have a much higher biomass yield, but the quality of the fibre would be inferior. Dagga cultivars may give good biomass, but will not provide good fibre and will be very difficult to process for fibre due to too many branches. In Australia,, growing chinese hemp cultivars, they are getting 50t/ha of wet biomass from hemp in a similar climate to ours. Saying that, even if hemp is only getting 20t/ha, it is still way better than many other alternatives and should be encouraged, especially with the byproducts of seed and good quality fibre. What we have done here is showcase what is possible with building from hemp, and if we had not have done it, thousands of people would be reading these articles or hearing about hemp on radio/TV etc, and would remaining thinking that Cannabis is only good for burning. One major assumption you make is that everyone who is involved with hemp had their first interaction with Cannabis through Dagga. While this is true in some cases, I can assure you that many of our partners, supporters, as well as the architects/scientists/builders that I have met in the industry internationally have never come close to a joint in their lives. Cannabis does not belong solely to those that wish to smoke it or use it for medicine, that is an attitude that will keep it marginalised forever, as the plant has many more things to offer than THC. We may not be approaching it from the angle you are, but essentially we are aiming for the potential for hemp/cannabis to be recognised as way more than a drug/evil weed, and support and constructive critisism would be appreciated. We are on the moment doing an ecological impact study about the hemp house project, it will take all the facts in account, like transport and import, water, waste, land coverage etc. The Carbon foot print is only one part of the ecological study, but will be shown. in the end result which will take some time before its finished. @DaggaParty I think you're missing the point here on a number of levels. The house is a MODEL, it shows what can be done if the growing of hemp is legalised in SA. To build the model, the materials had to be imported. If the materials were available here, the footprint would be very low. Again, the house is a model to show people what can be done and to change mindsets. Yes, dagga should be legal but that is a different issue to what the hemp house is trying to achieve. Saying that, there are many ways to skin a cat and changing peoples' perceptions of hemp may be a step in the right direction regarding the legalisation of dagga too. Simply accusing hemp enthusiasts of not helping the dagga cause is shortsighted, as well as inaccurate. Cannabis sativa 'dagga' (high THC) is more productive (approx 30-35tons biomass/ha/season) than imported low THC varieties of Cannabis sativa (approx 17-20 tons biomass/ha/season). We will never see hemp legalized in South Africa until we get over our "dagga verskriktheid"and recognise that dagga (THC and other cannabinoids) is a medicine that prevents and cures cancer. Hemp enthusiasts who turn away from the dagga issue are not helping our country. I would like to ask where did all the hem used in Tony's house come from? Imported? perhaps the calculations on the house's carbon footprint can take that into account. Citizens could be growing their own houses if dagga was leglaized in South Africa. This house is a good example of what can be done, but it will only be viable for everyone when dagga is legalised. The home is completely biodegradable and features one of the most sustainable building materials on earth: hemp! The flooring is made from cork while 85% of the cabinetry and furniture is made from hemp. With superior insulation, north/south orientation, solar paneling, rainwater harvesting, and advanced wastewater treatment systems on-site, this incredible showcase building is so much more than just the "Hemp House." Hemp continues to sequester carbon - making it a great combatant against greenhouse gas emissions. Although it is illegal to grown hemp in South Africa, Tony Budden's efforts (combined with others) may well pave the way to establishing a local industry that would have widespread benefits for South Africa's people. Since this is South Africa's very first modular hemp home, the building process entailed a steep learning curve. But the home came out beautifully in the end.